We’re big fans of the Subaru Viziv concepts here at Jalopnik. They look like Subarus you’d make from folding paper. It’s no surprise, then, that the new Subaru Viziv Tourer Concept looks awesome, too. And it probably helps that it’s brown. Subaru reports that it has a boxer engine and a symmetrical all-wheel drive layout. 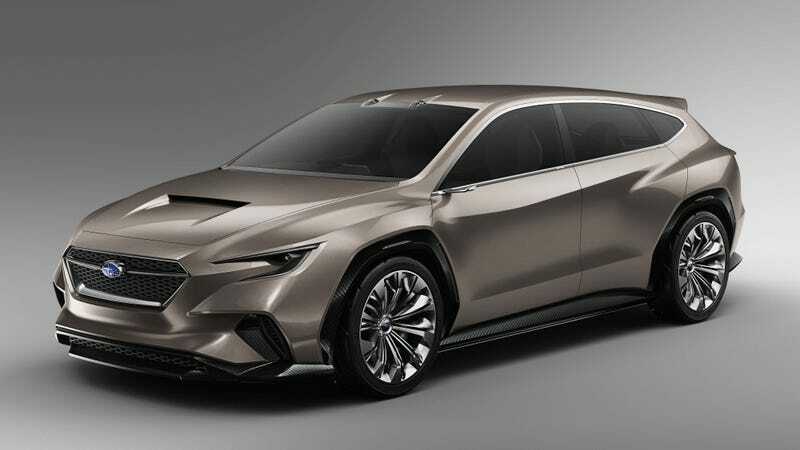 The concept has all kinds of driver-assist tech on board, like radar and GPS, the likes of which Subaru hopes to roll out around 2020. It’s unclear what’s propping up the skin of this pretty concept. The Outback platform, perhaps, but it doesn’t look tall enough for that. Maybe it’ll become... the WRX wagon? One can only dream. ... other versions of the WRX family could use more conventional inline four-cylinder engines, as hinted to Autocar by Subaru design chief Mamoru Ishii late last year. He suggested boxer engines were not essential ingredients for many Subaru customers, while also hinting that electrification would be important to help cut emissions. Guess we’ll see when the time comes. In the meantime, let’s enjoy these three photos together.